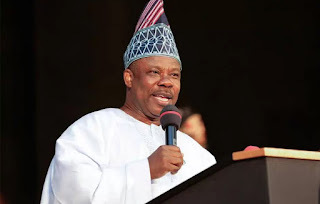 Ogun State Governor, Ibikunle Amosun, has inaugurated an 85KWP solar hybrid mini-grid at Gbamugbamu Village under the Ijebu-East Central Local Council Development Area, saying that it will help supply power to 487 households. Speaking during the ceremony, Amosun explained that the project, which was in collaboration with the European Union and German Government under the Nigerian Energy Support Programme, was in line with his administration’s rural infrastructural development agenda. While calling on the people to collaborate with the investors to bring dividends of democracy to the area, he said that the project would be of great benefit to the small, medium and micro businesses in and around the community, thereby contributing to the development of the national economy. In his remarks, the Minister of Power, Works and Housing, Mr. Babatunde Fashola, represented by the Minister of State, Suleiman Zarma, said that the project would improve the lives of the people, assuring that the government would continue to engage the private sector for the benefit of Nigerians. The EU, German Government and the United States of America, through their various representatives, expressed optimism that the project would bring development to the community.